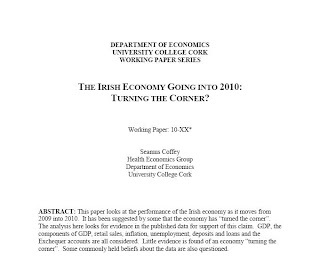 Economic Incentives: The Irish Economy Going into 2010: Turning the Corner? The Irish Economy Going into 2010: Turning the Corner? Back on the 11th of January I gave a one-hour seminar to the Faculty of Commerce in UCC called The Irish Economy Going into 2010: Turning the Corner? The slides using in the seminar were posted here previously. An draft of the paper presented was submitted to the Department of Economics Working Paper Series. A pdf of the paper is available here. Why isn't the corporate income tax progressive? Retail Sales Data not "Turning the Corner"
Tax Revenue for 2010 will fall below €30 billion. They Like Us. They Really Like Us. But why?